Piab's piSMART® vacuum technology will widen the scope for auto tuning, ensuring safety. Taby, Sweden – Building on the smart features already present in some of Piab's vacuum technology products, the company's Industry 4.0 strategy piSMART® will see the scope for auto tuning widening. Auto tuning of machines or machine parts is an example of the sort of technical assistance and decentralisation that form the basis for Industry 4.0. In recent years, Piab has been busy introducing new equipment features promoting smart production methods based on auto tuning. Such advanced features include the Automatic Level Determination (ALD) which automatically sets the optimal vacuum level in each cycle, ensuring no objects are accidentally dropped. Together with Automatic Condition Monitoring (ACM) ALD also supports an Energy Saving (ES) feature for minimised air consumption. When objects are supposed to be dropped, the Intelligent Blow-Off (IBO) feature makes sure blow-off air is applied only when needed, enabling air consumption savings of up to 50 percent whilst maximising operator safety. Eliminating the risk of unwanted vacuum build up in suction cups, the Self Adhesion Control (SAC) adds another level of security in the system. These important security aspects will be further strengthened through interconnections with the wider system and internet connectivity as this will enable more accurate auto tuning, thus ensuring that the equipment is used correctly. Real-time and accurate operator guidance will minimise the risk of human error. 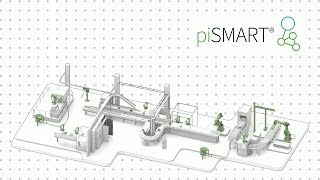 With piSMART®, Piab continues to build on its commitment to safety by getting an increasing number of its most advanced vacuum technology products equipped for the smart factories of the future.